This page is written by the game's inventor, Erez Schatz. This variant was created for the 44 Squares contest. I've played with several board schemes until I came up with this one. Once I came up with the board, it sort of suggested the theme and the nature of the game. This variant is played on a slanted board, cut from the orthodox 8X8 board. The board was imagined as being tilted sideways, so that "forward" is actually "north-west" (up-left). Another idea was to combine pieces from ancient variants that would comply with the board and the overall feeling of the variant. This variant combines pieces from Shogi, Chaturanga, and my own. I've considered several names for this one, including slanted or skewed chess. I finally settled for Med chess, as the Hebrew numero-equivalent to 44 is Mem-Daled. The board is also the middle part of the Orthochess' 8X8 board. Ferz g2; Kirin (Unicorn) h3; Pawn e1, f2, g3, h4. Ferz b7; Kirin (Unicorn) a6; Pawn d8, c7, b6, a5. 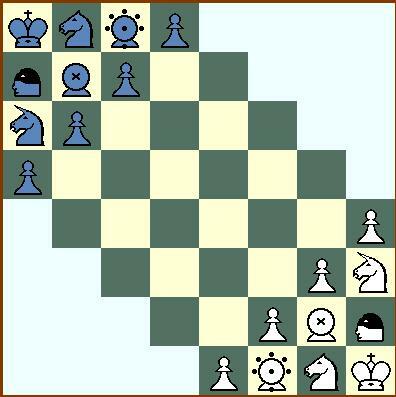 The goal of the game is to mate the opponent's King. Unless stated otherwise, the game is played like FIDE chess. To simplify matters, the board is to be regarded as in the diagrams above. Hence diagonal, orthogonal, up, down, left, and right are the same as in normal 8X8 chess. If played on an actual board, however, it is recommended to be played sideways. King (K): Same as FIDE chess. Knight (N): Same as FIDE chess. Assassin (A): Can only move by leaping over a piece located in an adjacent square in any direction to an empty square on the other side of the piece. The Assassin can capture a piece that is located in an orthogonally adjacent square. This is a distance capture. It can either move, capture or move and capture. Both Assassins start and move only on black squares and can only capture pieces that are on white squares. This piece is taken from Infantry Chess. In this diagram, the White Assassin, in the middle, can distance-capture the orthogonally adjacent Black Pawn (I) or the Black Knight (II) without moving, but not the diagonally adjacent black Pawn (III). The Assassin cannot leap over the Pawn (III) because of the black Ferz (IV), but it can leap to all the squares marked with an X. The square marked with a yellow X allows it to protect the White Knight (V) and threaten the Black Kin (VI). The Assassin can choose to leap over the Black Knight (II) or the Black Pawn (I), and then capture it. The Assassin also protects the White Kirin, but not the White Pawn. Kin (G): Moves one square in any direction except orthogonally "left" and orthogonally "right". In other words, this Kin variant, if placed on a regular board cannot move down/south or right/east. For example, a White Kin in E4 can move to D3, D4, D5, E5, F5, and F3, but not to E3 nor F4. This piece is also known as Gold General and is a variant of the Shogi piece. This diagram shows all the possible moves of the Kin. Ferz (F): Moves one square in any diagonal direction. Kirin (U): Moves one square in any diagonal direction, and leaps two squares in any orthogonal direction. This piece is also known as the Unicorn from Chu Shogi. This diagram shows all the possible moves of the Kirin. 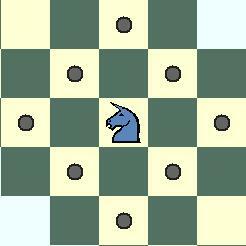 Pawn (P): Moves one square diagonally forward, captures orthogonally forward. This piece is similar in movement to the Berolina Pawn. For example, the Pawn in F2 can move to E3 only and can capture a piece that is located at either E2 or F3. A stalemate results in a draw. A bare king loses, unless he can bare the opponent's King in his next move. In that case the game is drawn. 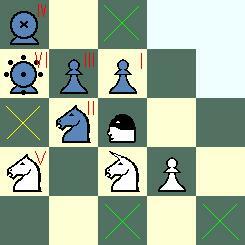 There is no initial double move for the Pawns. Upon reaching the straight edge of the board, (i.e. a5-a8, b8, c8, and d8 for white and likewise for the black), the a Pawn immediately promotes to a Ferz. This game can be easily played on an 8X8 board with the standard pieces (an upside-down rook could be used for the fifth "officer" piece). I've used the English name of the pieces when choosing notation (G for Kin, U for Kirin) for simplicity's sake. The zrf has been created by the honorable Mr. Uri Bruck, who has also influenced the Gold General's move. WWW page created:April 23rd 2004. Thanks for the comment, the Alfaerie images are sometimes a matter of hit and miss. I think it's more hit than miss this time, but it's open to interpretation. Besides, one can always download the (excellent) zrf and change the graphics :) I didn't think about the similarity, but you can always refer to them as Gold General, Unicorn and King. Whoops about the ZRF! Fixed now. Thanks Peter, the page looks great! However, the zrf was made by Uri Bruck, not by me. I very much like this variant and look forward to playing it soon. I do have two concerns: 1) The graphic used for the Kin might lead someone to assume it moved in a different manner than the rules allow. 2) King, Kin and Kirin look like easily confused names. Both of these issues are minor quibbles that in no way undermine my overall good initial impression of the game. This is a competing entry in the 44 Squares contest.